The Nash’s have been working in the Timber Industry for many years establishing Rozelle Recycled Building Centre which was renamed Ironwood. In 2003 we revamped our approach to our business vision on how we wanted to introduce the timber flooring and timber products to our clients. Our aim was to personalize and ensure that the timber was the outstanding feature in the projects due to using it correctly. Nash Timbers of Sydney, leaders in new, engineered and recycled timber are supplying Australian Hardwood Flooring, Engineered French Oak & European Oak Flooring, external post, beams, decking, cladding and staircase material to prestige homes and commercial environments. NASH TIMBERS takes an holistic approach consulting with the client, architect, interior designer and builder to ensure the best timber product is provided. 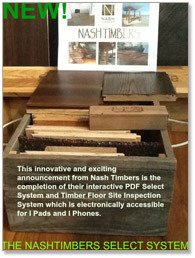 This innovative and exciting announcement from Nash Timbers is the completion of their interactive PDF Select System and Timber Floor Site Inspection System which is electronically accessible for I Pads and I Phones. Timber flooring installation systems and techniques are explained plus, our detailed electronic Site Checklist helps our client address all issues that will affect the outcome of obtaining the ideal conditions for their timber floor stability. Nash Timbers are using a calculated formula to measure the moisture content of the timber floor which then allows us to install the floor with evidence based results which should result in a more stable floor. It is important to always remember that timber is a "Living Product"
We encourage our clients to visit our Timber Sample room by appointment in our Sydney office. Otherwise, a meeting can be organised to help take the client through their timber inquiries. With more than thirty years in the timber industry my passion and desire for timber continues to grow, as does my absolute unwavering desire for customer satisfaction. Myths and mysteries are well established in this industry and to make it easier and more understandable we have developed the Nash Timbers Select System.